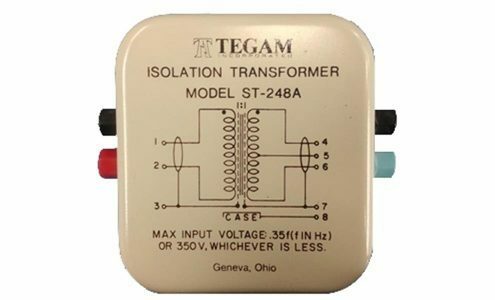 TEGAM's ST transformers are designed to meet the requirements of a wide variety of bridge circuitry, isolation and calibration applications. The ST units can be used to provide a balanced output from an unbalanced source. These transformers may be combined with TEGAM ratio transformers in bridging circuits, to isolate the null indicator. The ST-248A features very accurate 1:1 ratio for isolation or phase inverting applications. Units are also used with TEGAM Ratio Transformers to provide 180 degree phase shift to the input or output of the instrument in certain bridge applications. The ST-248A also has electrostatic shields and a center tapped secondary.